The engaging game-based leadership assessment tool that gets results! Leadership is never easy, but it is pretty simple if we keep in mind that we need to treat our team members as people first – and employees second. 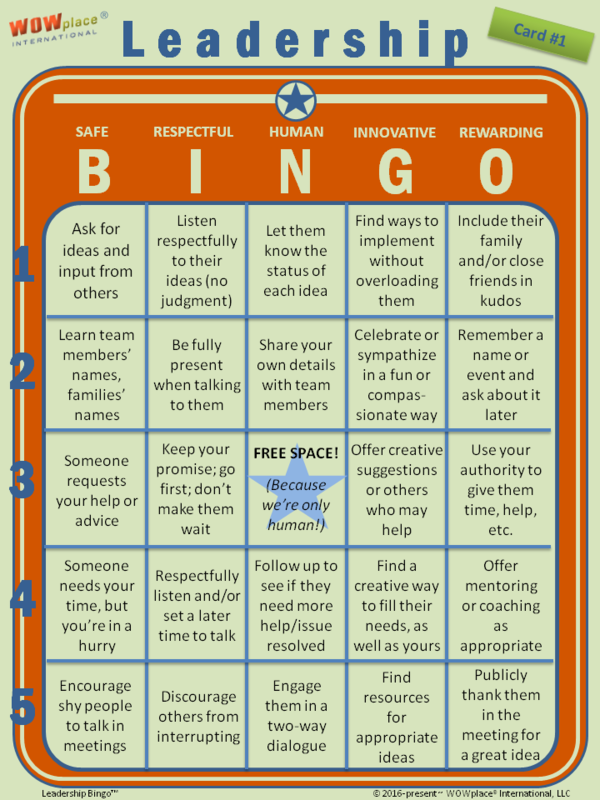 Leadership Bingo™ is the perfect tool to help us assess our strengths and opportunities when it comes to the everyday actions we can take to inspire and engage our teams. 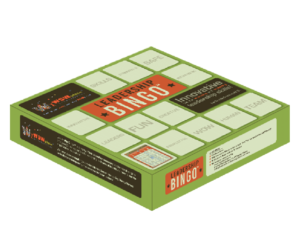 Leadership Bingo™ is a proprietary leadership assessment tool developed by Sandy Geroux, M.S. to help leaders quickly and easily identify their leadership strengths, as well as any gaps or “blind spots” that may exist in their leadership skill set. In addition, since consistency is a crucial factor in a leader’s effectiveness, the tool also helps measure a leader’s consistency at every step of any given situation. It can also be used to help leaders assess the organization as a whole and assist them in recognizing and addressing significant gaps, as well as strengths, in the leadership team’s collective skill set. 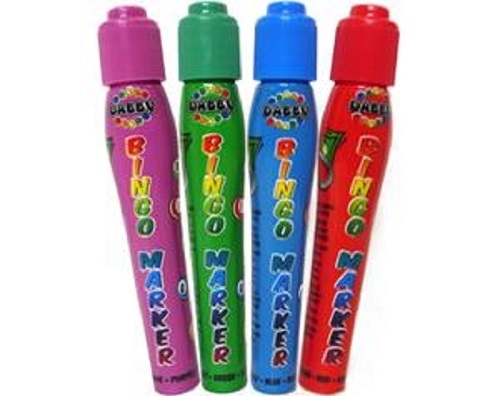 The goal is to get as many “Bingos” as possible by marking an X in all squares in one column or row. Each column represents a set of leadership skills corresponding to one of the Rules, while rows represent various workplace scenarios to be analyzed and assessed for leadership consistency. 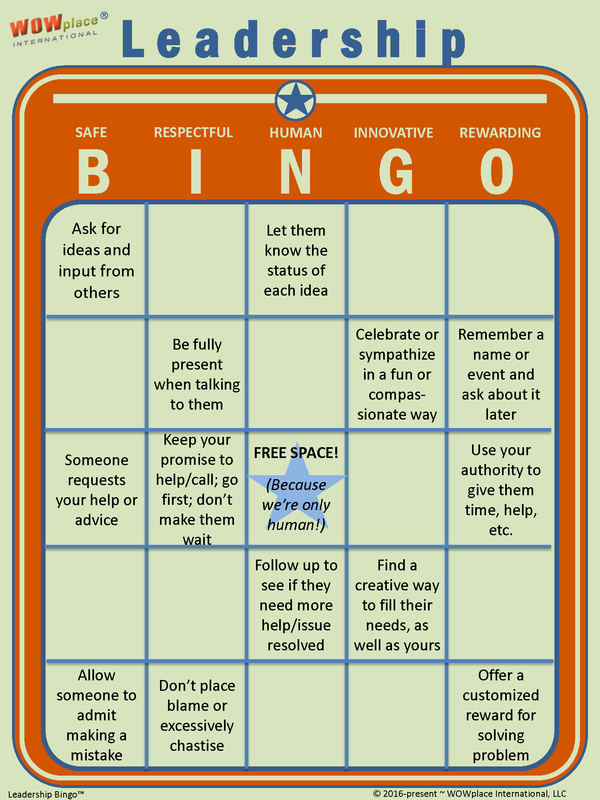 Of course, as in regular Bingo, there is one FREE SPACE in Leadership Bingo™ – because we’re only human! You can even CUSTOMIZE Leadership Bingo for your organization! 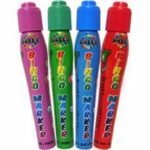 Simply send us your logo and our designers will include the logo and customize the colors of your Bingo card for your organization. Option #1: The complete Do-It-Yourself Boxed Kit containing 50 Bingo cards, 50 Bingo daubers, a Facilitator’s Guide, a USB drive containing the Power-Point-based game and training video setting up the training concepts, and a copy of Sandy’s book, Turn Your Workplace Into a WOWplace, to use as a future reference guide and for more case studies and examples. View your Shopping Cart to increase or decrease quantities, remove items and checkout. Option #2: A combination of Do-It-Yourself and Sandy facilitating certain portions of the program. With this option, you will receive the kit and all of its benefits, but instead of attendees watching the training video, Sandy will conduct a live webinar for your people to introduce the training concepts, where they can interact and ask questions of me. 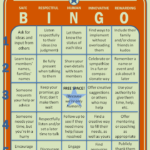 After the webinar, you will then conduct your own session of Leadership Bingo. Contact Sandy via one of the methods listed below to discuss this customized option. Option #3: A complete, customized session facilitated by Sandy, where she will travel to your location, conduct the training and game in person… and conduct a train-the-trainer session for selected representatives from your company, so they can facilitate the training and game themselves in the future. You will receive all materials for the initial session, as well as the boxed kit for future use. 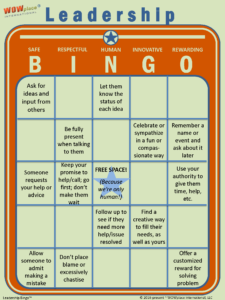 Bring Leadership Bingo™ to your organization as part of a leadership training program, or as a stand-alone leadership skill facilitation, to help guide your team to WOW Leadership by closing the gaps in their leadership skill set… and identifying and strengthening those in which they excel! Use our online form to Book Sandy Now!